Investor Voice – the shareholder engagement process does not cost money, it saves and can even make money for companies wise enough to listen to the investor voice. Glass Lewis – In summary, our view is that the current hurdles and protections in place around the shareholder proposal process are working, and are sufficiently protecting both the interests of issuers and investors. Real Impact Tracker – Keeping the submission threshold low allows young people to ensure their interests are represented in the companies they own… The SEC should consider amending Rule 13D to allow easier collaboration among investors. Proxy Insight – The number of investors delegating their entire policy and voting to a PVA is actually very low – from a sample of 1,413 investors, 75% have their own dedicated proxy voting policy representing a significant 92% of the assets under management. Ceres – Shareholder proposals do not meaningfully increase costs for companies… On average, 13% of Russell 3000 companies received a shareholder proposal in a particular year between 2004 and 2017… Only half of the proposals submitted by shareholders in 2016, for example, appeared in companies’ proxies. Consequently, relatively few companies—fewer than 500—held votes on issues submitted by shareholders… Less than 9% of Russell 3000 companies that have had an IPO since 2004 have received a shareholder proposal… From 2004–2017, the Chevedden, Steiner, and McRitchie families submitted 14.5% of the 11,706 proposals filed. On average, 40% of shareholders voted in support of these proposals when they went to a vote… [M]ore than 25% of assets under management in U.S. markets are managed with some form of ESG strategy according to US SIF. Clearly, ESG issues are frequently financially material. Receiving investor input on such important issues can help managers steer their companies in the right direction. Sustainable Investments Institute (Si2) – [M]any corporations have responded to their shareholders’ requests by changing their behavior. (Reports available at https://siinstitute.org/reports.html)… The key question the commission should consider in evaluating any proposal that would further limit proponents and proposals is why less information and fewer ideas will make for better functioning markets. Minerva Analytics – The problems of plumbing are not those of by either technology or standards. Rather they are a function of legacy regulations, systems and procedures which have resulted in anti-competitive business models. There is extensive and consistent evidence from international markets which shows that firms whose profitability is entirely dependent on such archaic systems are at the root of nearly all the plumbing blockages. Pax World – [O]ne recent meta-analysis from Deutsche Bank1 looked at more than 2,200 individual studies and concluded that the majority of those studies found a positive correlation between ESG criteria and corporate financial performance. Society for Corporate Governance – Recently, Professor Jill Fisch’s Minnesota Law Review article, “Standing Voting Instructions:Empowering the Excluded Retail Investor” thoughtfully addresses these issues and concludes that SVI is an appropriate means for improving retail participation. Just as important, Professor Fisch suggests that SVI would enhance retail shareholder engagement in corporate governance – a goal the Commission should embrace wholeheartedly… N-PX reports need to be clearer and easily understandable and should be expanded to cover a broader group of shareholders –namely, all shareholders who file Form 13Fs, rather than just mutual funds. US SIF – The US SIF Foundation’s Report on US Sustainable, Responsible and Impact Investing Trends 2018 finds that $12 trillion in US-domiciled assets under management use SRI criteria, representing 1 in 4 dollars under professional management. Money managers who responded to the report’s survey cited client demand, risk, return, social benefit, mission and fiduciary duty as the leading reasons that they consider environmental, social and governance factors… Rule 14a-8 offers issuers a number of pathways to seek no-action relief to exclude proposals. Second, just because NAM attempts re-frame certain issues in the media as “political” doesn’t make those issues immaterial to the well-being of the corporation. AFL-CIO – For the 12 months ending June 30,2017, only 21.7% percent of shares voted after receiving Notice and Access mailings compared to 40.9% o f shares that received full packages o f printed proxy materials. Because many retail shareholders are unable or unwilling to obtain proxy materials electronically, the electronic dissemination of proxy materials should be “opt-in” rather than “opt-out.”… We are concerned that the technology of “virtual” shareholder meetings may be abused to unreasonably screen shareholders’ questions and silence dissenting views. Council of Institutional Investors (CII) – [O]ur members believe it is time to look seriously at the use of distributed ledger technology, system-wide, to promote the goals articulated earlier, while safeguarding the identities, holdings and vote decisions of individual shareholders… SEC should promptly adopt the final rule largely consistent with the 2016 SEC proposal on Universal Proxy (2016 Proposal)… The cost to public companies of the existing shareholder proposal process is generally low and the process often results in benefits to companies. It is important to note that most companies receive few, if any, shareholder proposals. The average Russell 3000 company can expect to receive a proposal every 7.7 years. Walden Asset Management – [E]ngagement and proxy voting on ESG considerations are motivated by investment managers’ fiduciary duty, assessment of risk and long-term shareholder value, and commitment to client objectives. Interfaith Center on Corporate Responsibility (ICCR) – The argument for raising thresholds has been championed as a means of addressing so-called abuses in the system, including claims that shareholder resolutions are a burden on the markets… Approximately 200 social and environmental resolutions came to a vote this year, hardly a burden on the markets and companies… There are many examples throughout the history of shareholder engagement of issues that initially received little support, but went on to be appreciated for the serious risks they presented to companies. The issue of declassified boards is just one example – support of shareholder proposals on this issue was regularly below 10% in 1987, but eventually grew to 81% in 2012, and it is now considered best practice. Los Angeles County Employees Retirement Association (“LACERA”) – Shareholder proposals represented about 2% of LACERA’s total proxy votes in fiscal year 2018, and about 3% in both FY2017 and 2016. Cornish F. Hitchcock – I attach to this letter a pending rulemaking petition that is directly relevant to the Commission’s concern about “proxy voting mechanics and technology,” particularly as those issues pertain to retail investors (File No. 4-651). The petition outlines some straight-forward regulatory steps that theCommission could take to update applicable rules for the Internet age and make it easy for retail investors to receive, store and access their proxy materials, as well as to vote their proxies. The petition draws on the experience of MoxyVote, which operated as such an online neutral platform for retail investors until it had to cease operations in 2012. Shareholder Rights Group – [T]he average Russell 3000 company can expect to receive a proposal once every 7.7 years… Less than half of all submitted proposals actually go to a vote… According to the ISS database, the Chevedden, Steiner and McRitchie families submitted approximately 1,700 shareholder proposals between 2004 and 2017. Proposals by this group of individual investors represent 14.5% of the 11,706 shareholder proposals contained in the ISS database. On average, 40% of shareholders voted in support of these shareholders’ proposals when they went to a vote. James McRitchie (I will supplement) – Allow universal proxies so I don’t have to go to meetings to spit my vote. Ban virtual-only shareholder meeting and encourage hybrid, so boards cannot ignore the tough questions. Break up the monopoly on proxy delivery. Allow independent platforms, like the old Moxy Vote, to collect fees designed to move proxy delivery from paper to electronic. Jill Fisch – I recommend that the SEC reform the proxy voting rules to support the creation of voting platforms through which retail investors could establish standing voting instructions with respect to their portfolio securities. Such platforms would be similar to the platforms that are currently available to institutional investors. Listed below are a few press reports on the SEC’s Proxy Process Roundtable. Looking back over time, the shareholder resolution system works. So why these discussions again? In great part, it is because the system has been effective in raising social and environmental issues to the fore and recognizing that they are, indeed, material issues for companies. In the end, there are many voices that would like to reduce attention to these fundamentally important issues and suppress innovative shareholder ideas, even where they have been shown to reduce corporate and shareholder risk over the long term. The topic of reigning in the proxy advisory firms, which some view as having too much unaccountable power over proxy votes, has become something of a political hot potato. (See, e.g., this PubCo post and this PubCo post.) But the panel’s discussion regarding the power of proxy advisors was surprisingly tepid. More than a dozen panelists at the roundtable agreed that increased use of electronic voting and the introduction of new technologies, particularly a blockchain-based system, or an immutable distributed ledger, could increase accuracy, as well as reduce the costs of shareholder and proxy votes. Perhaps more important, the five SEC commissioners’ statements concurred that it’s time for an update. NAM/Chamber’s Campaign Encouraged Attendance – Recently, the National Association of Manufacturers & the US Chamber have been running ads against proxy advisors – including full-page spreads in the WSJ and Washington Post. They’ve spent six figures on their media campaign! Here’s what the ads looked like. 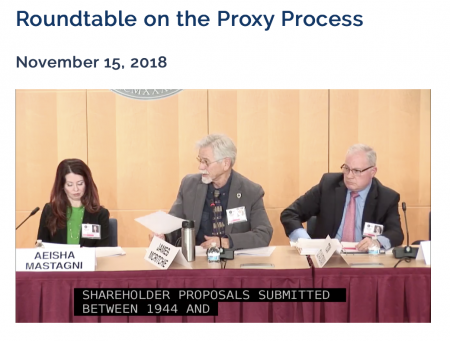 As part of this campaign, the groups operate ProxyReforms.com – a site that had been encouraging folks to attend the last panel of the day (the one about proxy advisors). Ahead of the roundtable, the National Association of Manufacturers, a trade body, and the US Chamber of Commerce spent almost $1m on an advertising campaign that said that it was time for reform of the proxy advice system. Before you throw your hat in the air at the emergence of spokespersons for the small investor’s interests, there are a couple of things you should know about the Main Street Investors Coalition. First, it’s a creature of corporate managements and a front for their interests, not the individual investors’. Their goal is to narrow, not expand, the opportunities for shareholder interests to be brought before corporate boards and managements. With little hope of overturning the say-on-play rule, which was mandated by law as part of the 2010 Dodd-Frank Act, the industry groups have instead turned their sights on so-called proxy-advisory firms like Institutional Shareholder Services and Glass, Lewis & Co. Improving proxy-voting system discussed at SEC roundtable – Pensions and Investments. Ken Bertsch, executive director of the Council of Institutional Investors, highlighted the SEC ‘s 2016 proposed rule that would require the use of universal proxies in contested elections as something to consider. Mr. Bertsch also endorsed looking into using blockchain technology in the proxy-voting process. The technology would ensure vote confirmation, enhance privacy and security, and reduce mailing costs, he said. If the ultimate human investors do, in fact, want their funds to take social responsibility into account when voting their shares, why is that a problem for regulators to solve?… it seems apparent that much of the ire about “factual errors” in proxy advisor recommendations is, in fact, a dispute about the content of their recommendations. Business Roundtable’s comment letter to the SEC kind of gives the game away on this point (.pdf)… Commissioner Roisman said he had a new appreciation for how important proxy advisor recommendations are to shareholders, and that therefore it seemed reasonable to him that there be some kind of rebuttal period for companies to respond to firms’ recommendations and correct any errors. Which to me suggests some foreshadowing of what the SEC is likely to do. The SEC could be open to imposing a review period for issuers to assess the accuracy of proxy advisory firms’ reports prior to publication, SEC commissioner Elad Roisman said during an event hosted by the regulator last week… Meanwhile, a bi-partisan bill was introduced last Wednesday to the Senate Committee on Banking, Housing and Urban Affairs that would require proxy advisers to register as investment advisers under the Investment Advisers Act of 1940. Meanwhile, a bi-partisan bill was introduced last Wednesday to the Senate Committee on Banking, Housing and Urban Affairs that would require proxy advisers to register as investment advisers under the Investment Advisers Act of 1940. Barbara Roper, director of investor protection for the Consumer Federation of America which endorses the bill, is quoted in the press release for it. “This is a thoughtful and balanced bill that brings the benefits of government oversight to the proxy advisory business while recognizing, and strengthening, the fiduciary duty that these firms owe to their investor clients. The Consumer Federation of America strongly supports its adoption,” said Roper. In a series of advertisements, press releases, reports and regulatory filings, industry groups including the U.S. Chamber of Commerce and National Association of Manufacturers have attacked the process of corporate elections as distracting from executives’ pure motives of creating jobs and economic growth… According to the Economic Policy Institute, the average CEO among the 350 largest companies got an 18% raise in total compensation last year to $18.9 million. That amount was roughly 312 times the pay for the typical worker, up from 20 times in 1965 and 58 times in 1989… With little hope of overturning the say-on-play rule, which was mandated by law as part of the 2010 Dodd-Frank Act, the industry groups have instead turned their sights on so-called proxy-advisory firms like Institutional Shareholder Services and Glass, Lewis & Co… Of the 62 cases disputes [to the SEC] cited [by the Chamber of Commerce] for 2017, some 34 stemmed from the advisers’ disapproval of executive-pay plans; most of the rest related to negative recommendations on specific board members. Broadridge Financial Solutions, Inc, an S&P 500 company and global Fintech leader, announced that Raymond James Financial, Inc. has applied mobile integration of shareholder voting via Broadridge’s API to enhance the investor experience.